...the gift of a Serial Killer! That is correct...the woman who loves me, also knows me very well. For Valentine's Day, Nancy gave me the Season One AND Season Two DVD collections of Dexter, starring Michael C. Hall, the Showtime series about a serial killer whose victims are serial killers. You might also remember Mr. Hall from the HBO series Six Feet Under. 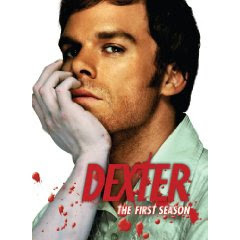 The first season of the show was based upon the novel by Jeff Lindsay entitled "Darkly Dreaming Dexter" (2004) Mr. Lindsay has added three more novels to the series; "Dearly Devoted Dexter"(2005), "Dexter in the Dark"(2007) and "Dexter By Design" (2009). I have not read the novels, but our friend STARRLIGHT from "Here Comes A Storm...In the Form Of A Girl" tells me that this is one of those rare cases where the TV show/movie is actually as good as the novel. I do not have Showtime, so I was only able to watch the edited version of the show CBS ran last summer. Those episodes were so choppy with the edits of language and graphic violence, that at times, it was almost impossible to follow why certain things happened. Now, I own the 8 DVDs that make up the first two seasons of the show. Friday evening Nancy and I sat and watched the first episode and she has immediately been drawn into the story, wanting to know more and more about how Dexter became Dexter. On her card she wrote that this gift would give us hours of enjoyment on our next "Weekend To Nowhere". They work great in the winter or when you have a miserable weather weekend...but they can be done at any time. It is a bit more difficult planning them around the weekends Nancy's sons are with their dad...and we have had some 'real-life' interruptions due to the boys needing their mom even on those weekends (don't ask! )...but we are planning one in the next few weeks and Dexter will certainly be the center of our viewable 'enjoyment' time. Well, when I request the CDs, sometimes they come from the PR firm and sometimes from the artist themselves. This time it did come from Chris. Marla Cilley is better known as The FlyLady, the larger than life self-help guru who helps women around the world stay organized and do housework. On December 7, 1999 someone asked Marla for help and the FlyLady mentoring group began. Now, almost a decade later she has nearly one million “FlyBabies” and is BlogTalkRadio’s most listened to personality. Jason Sadler of IWearYourShirt.com is spending 2009 as a human billboard. Sadler is selling the upper-half of his wardrobe (shirts). He’s selling every day of the year at face value, so January 1 was $1 and December 31 is $365. On July 28th, he will be wearing a Got Blogstein? t-shirt. We’ll prep him on what we want him to do in our shirt that day and then check in with him again on July 28th. 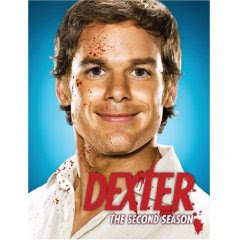 I keep hearing so much good about Dexter I am going to have to buy the first season soon. I think I like Chris Huff's newer stuff more than his old stuff. I got to say, Dexter became addictive when we first started watching. We felt a little weird, liking a show about a serial killer. Now we can't miss a show! I think I just put my finger on what "bugs" me about Chris Huff's voice. I shouldn't phrase it that way, because he's got a nice voice; it's pleasing. He reminds me of the Catholic musicians I know; he enunciates his words so you can tell what he's saying! It doesn't seem "appropriate" for the types of music he sings. I guess I was expecting more earthy sounds, he's got a clear voice. That sounds like I'm nitpicking, but his voice sounds too pleasant to sing the types of music he's doing. Schmoop and I have Weekend to Nowhere nearly every weekend, 'cause typically neither of us remember what the hell happened. Cheers Vinny!! hmm, cool! I didn't know Dexter was based off of a book. I haven't seen the show, but a lot of people have said I would enjoy it! Dexter is very cool. I've had to find it online though since I don't have Showtime. I thought about dropping HBO and getting Showtime, but then I would miss Entourage and True Blood. So I just don't know what to do. I have Weekends to Nowhere quite often. Only I spend them alone. Gift giving is an art. I think Nancy has it down perfectly. The weekend to nowhere concept is great...unless one of you is a bit AADD...and one of you tends to be a hermit. laughing. SONGBIRD: As I explained to Chris in our emails, my guests are great lovers of music and y'all have different tastes. Any artist who has a goal of being successful will accept well thought out comments as yours was. MATT-MAN: LOL...yeah I can see that! JESSICA: It is pretty cool, if you like serial killers...and I do. JAY: I have that problem being an HBO fan. I might have to get both next September! KATHERINE: That she does. We have done it and it has worked. I think her having 'younger' kids makes it easier, because a weekend without drama is always welcome. Getting on the bike and just going is also a great idea. I've never heard of Dexter-it sounds very interesting and like something I'd enjoy too. Unless it's really bloody and gross. Then I wouldn't enjoy it! I've done weekends to nowhere before too-love 'em! 'Then We're Dead' is kind of styled like a 45 single about 1969-70. I can't say if it's good or bad in content for the pop-styled hooks. It is nice to have the artist that his works are art...to the artist, first. The artist must be true to his own art, and if some art lovers like the work, and some not, that reflects 'true' art - in the eye of the beholder! Dexter is WONDERFUL! I'm sure you'll enjoy that loving (?) gift! And I'm still a bit lukewarm on Chris Huff, but that really is an issue of his music not being my preferred genre. Just in time to check out the show! Gotta love those weekends to nowhere. We're due for one soon. Thanks everybody for your comments. And thanks to Vinny for posting me two days in a row! Have a great rest of February. Oh no no no. We want to know about the "real life" moments. You can't just throw that out there like that. I love adore miss love adore weekends to nowhere.